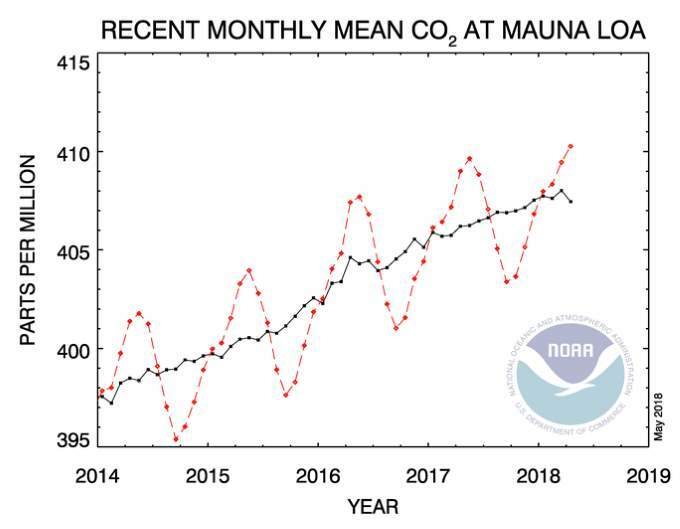 The graph above shows recent monthly mean carbon dioxide measured at Mauna Loa Observatory, Hawaii in the last five years. It is published by the National Oceanic and Atmospheric Administration (NOAA) Earth System Research Laboratory Global Monitoring Division. The last four complete years of the Mauna Loa CO2 (carbon dioxide) record plus the current year are shown. Data are reported as a dry air mole fraction defined as the number of molecules of carbon dioxide divided by the number of all molecules in the air, including CO2 itself, after water vapor has been removed. The mole fraction is expressed as parts per million (ppm). Example: 0.000400 is expressed as 400 ppm. The last year of data is still preliminary, pending recalibrations of reference gases and other quality control checks. The Mauna Loa data are being obtained at an altitude of 3400 m in the northern subtropics, and may not be the same as the globally averaged CO2 concentration at the surface. 410.31 ppm is the highest level reached in the 800,000 years. We are pretty sure about that: scientists have been studying gas bubbles trapped in glacial ice. By drilling more than 3 kilometers (1.86 miles) deep into the ice sheets over Greenland and Antarctica, scientists can see how temperature and atmospheric carbon-dioxide levels have changed since then. The air bubbles trapped in the ice can tell us the type of greenhouse gasesNotes 1 in the ancient atmosphere. The ice may also contain the dirt or other tiny particles which tell us when there were past volcanic eruptions. So, each ice core acts like an atmospheric time capsule. With the valuable information that they contain, scientists can compare the climate conditions of past to today. By studying the climate of the past, scientists also can make predictions about the future. The last eight glacial cycles cover 800,000 years, and researchers are fairly confident that CO2 levels haven’t been higher than today’s levels in all that time. In fact, the new record may hold for even further back in history. A report published last year by the World Meteorological Organization revealed that 2016’s CO2 levels were higher than they’d ever been for at least the past three million years. And, in the following two years, we broke that record consecutively. According to the report, the last time the Earth experienced a comparable concentration of CO2 was 3-5 million years ago, the temperature was 2-3°C warmer and sea level was 10-20 meters (30-60 feet) higher than now. So, we can expect the oceans to rise substantially in the next 80–150 years. In fact, we already know that the global sea level rise has been accelerating in recent decades. Say goodbye to Miami, Venice, and all coastal cities! While it’s true that Earth’s temperatures and carbon dioxide levels have always fluctuated, the reality is that humans’ greenhouse emissions since the industrial revolution have put us in uncharted territory. Written by Dr Benjamin Henley and Assoc Prof Nerilie Abrams. Animated and edited by Wes Mountain for The Conversation.